Done At The Flats, It was a Great Year!!!!! Specks are In!!! 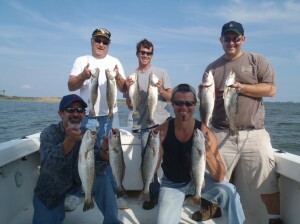 3-Speckled Sea Trout/ Striper Walk-on Trips!!!! A lovely lady with one of many great fish caught at the Flats this year! 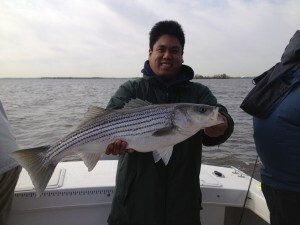 Folks, This year certainly was the best year in many years for numbers of Stripers. Caught some really big fish this year but I’ve had years with many more big fish. Overall, certainly a year to remember! On many days we had lot’s of surface hits on Stillwater Smack’it’s. I did 38 trips this year at the Flats, many more than past years and not one skunk trip! Had some tough days but no zero fish days. So glad this year showed up as a good one. On many days I started before daylight and my second trip didn’t end till dark. Makes for many long days but I love every bit of it. Just didn’t have enough time in the day to do trip reports daily……I could use some cheap help! My best day at the flats this year was a day with loads of fish in the wind. A northwesterly wind cranked but the fish were in the area just east of Battery Island and they were there thick and hungry! Almost all of thest fish were caught doing the old “lift while you drift” technique. 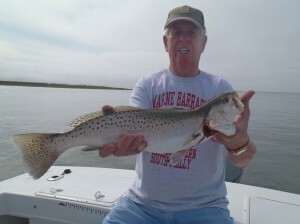 Many fish caught in the wind for 3 straight days. Many small fish this year. I don’t remember a year with so many really tiny Stripers. On one particular day they came in handy. I had a family with some youngsters and the small fish were the ticket. 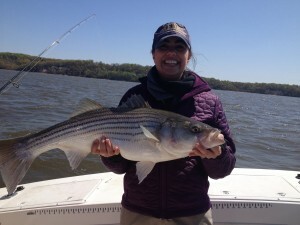 We had a blast catching many Stripers up to 20″ and some bigger and many smaller. Some great days on those fish and great crews! and this next one is memorable! Maxx’s Adventure, Fish Every State Before Graduation! On this memorable day I had a great family from Northeastern NY State. This crew had one thing in mind. Get there son on Maryland water and hopefully catch some fish. Kathy, her husband Dave and son Maxx were ready to fish it up……Maxx has a goal of fishing in every state in the U.S. prior to graduation, his parents Kathy and Dave are doing there best to make it happen. 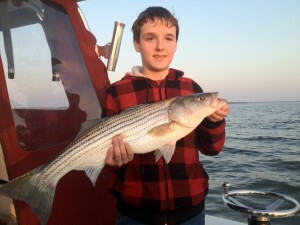 I was lucky enough to be on the Maryland menu of fishing spots for young Maxx. 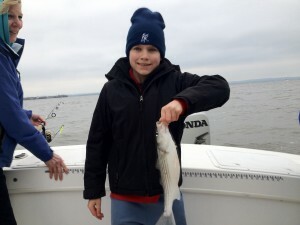 We climbed aboard my boat at 3 pm on a really nice day hoping for some flats magic, we got some, catching many Stripers up to around 32″ prior to sunset. 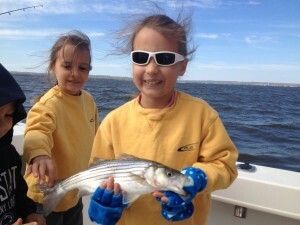 We had a great day of jigging up many Stripers on BKD’s (www.Basskandydelights.com ). Maxx and crew learned very quickly the technique and it paid off big time. 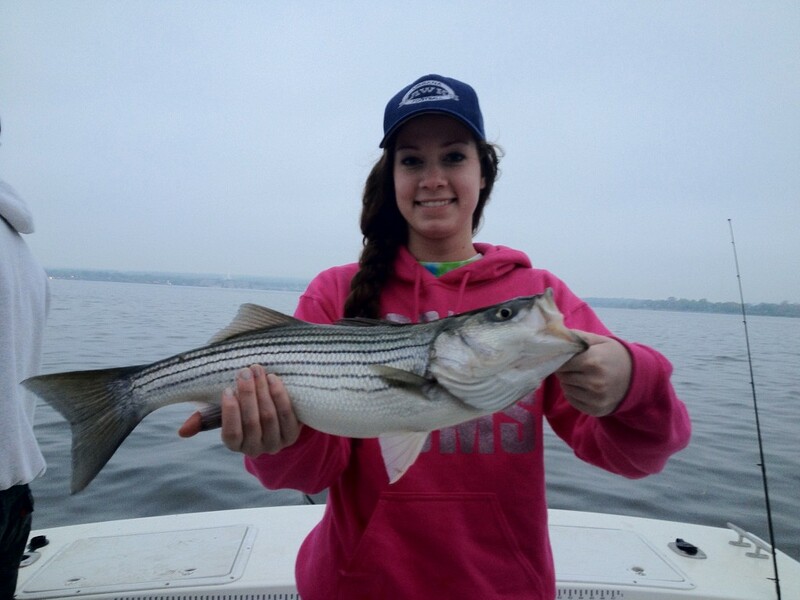 We caught many, many Stripers until the sun set! Here’s a few shots of Maxx’s adventure! 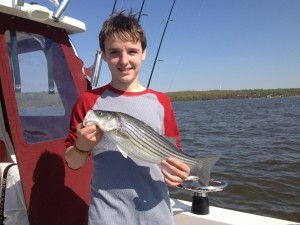 Maxx with his first Maryland Striper!!!! 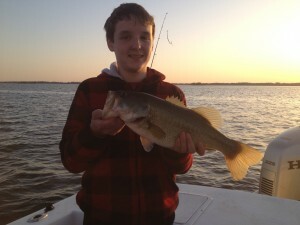 Maxx had a Susqy Flats Bonus…..5 pound Largemouth! 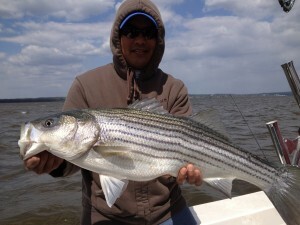 Beauty caught on a Surface plug near sunset, great Maryland fishing for Maxx!!! One day in late April I wittnessed something I’ve never seen at the flats in such mass. 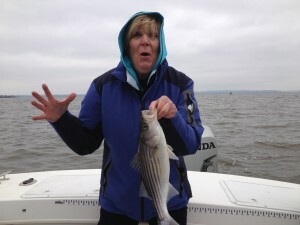 An area of 3 miles by about a mile Stripers were making babies like there was no tomorrow! Great to see a so many fish spawning. All the boats in the area paid close attention to the spawning fish and did not attempt to interupt the activities. Some small males were hitting BKD’s and 15 Tony’s during the spawn. Some huge females were in the area. I literally saw dozens of massive females on the calm night during the spawn. 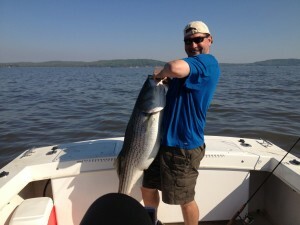 Prior to the spawn going off we did catch a c0uple of really big Stripers. In fact they were by far the 2 biggest fish of the season at the flats on my boat. This 49″er put up a tussle on light tackle…..a 6″ BKD fooled this big girl…..she was released at the boat and took off strong! This 50″ Fish was massive!!!!!!! Didn’t weigh it but it was HUGE!!!!! Biggest of the year at the flats and the biggest on my boat this year! The Susqy Flats really lived up to it’s great rep. this year. 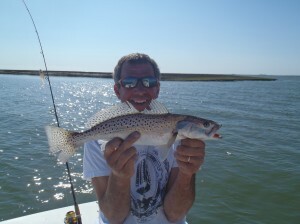 We had many days of great surface plugging, lot’s of jigging and many fish caught on 17 tony spoons. I love the flats but am glad to be home…….miss my kids and miss sleeping in my bed. The last few months I’ve been gone lot’s….between the CBBT and Susqy Flats I was out of town often…glad to be home!!!!!! THE SPECKS ARE IN TOWN!!!! I haven’t personally fished for them yet but will be very, very soon. Had to clean up the boat and get some maintenance done before I stick it back in the water at Beacon Marina in Solomons. I’ve heard from reliable sources Specks are in town! After last falls blockbuster Speck fishing I think this May could be just as good. 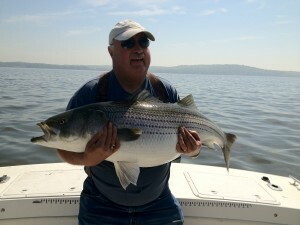 One great thing about specks is you catch stripers in the same areas as Specks. Beautiful, remote waters are the theme and bent sticks is usually a result of fishing the beautiful eastern shore waters!!!! 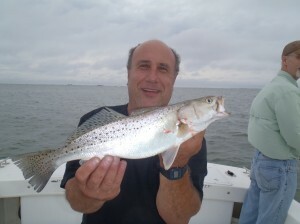 Nice South Marsh Island Speck! 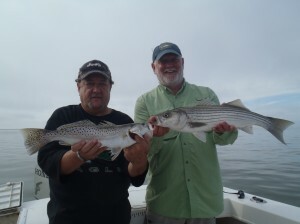 Stripers and Specks in the same waters…..really nice stuff! 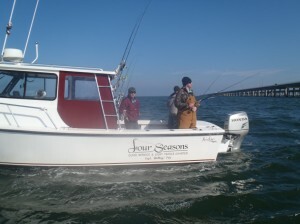 All the Speck fishing will be done around the islands of the eastern shore. The beauty of it all is worth the price of admission…..catching Specks and Stripers over there is a bonus that occurs quite often!!! What a relief it will be to fish this beautiful water not having to compete and become friendly with loads of boats close by…..ahhhhh!!!!! Well folks it’s time for Specks out of Solomons!!! 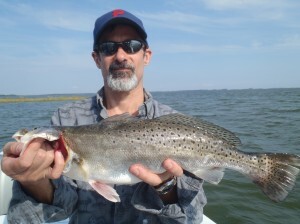 If you’d like a light tackle break from trophy trolling come on out and give the eastern shore a shot! We’ll be launching out of Beacon Marina in Solomons and running east and south. We’ll look for Specks over on the eastern shore and we’ll fish major structure on the main-stem of the bay on the way back for big stripers. Here’s the deal- $100 each, all baits, tackle and licensing provided. 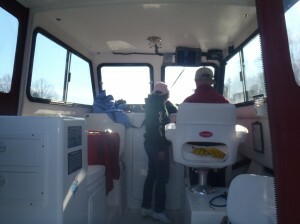 The first 5 callers are in…..we’ll launch at daylight from Beacon Marina out of Solomons, MD. 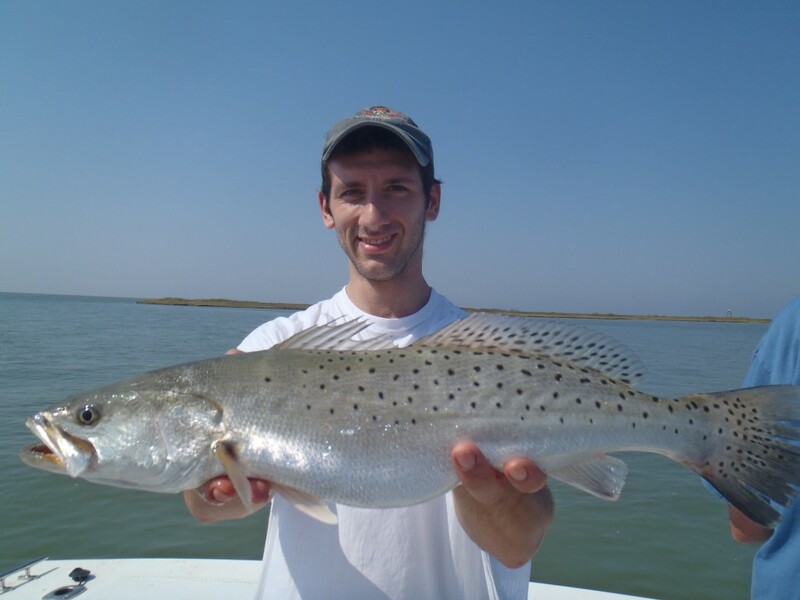 We’ll be running to the eastern shore targeting Speckled Sea Trout and Catch and releasing any Stripers we come across. If you are interested in coming give me a call at 703-395-9955 to reserve your spot! The boat is a Judge 27 Chesapeake…….very comfortable boat to run the bay! Closed cabin makes for a warm, dry ride and the shallow draft allows me to go wherever I need to find the specks in the beautiful eastern shore islands!!!! Very beautiful fishes big too. your boat must be full of fishes.